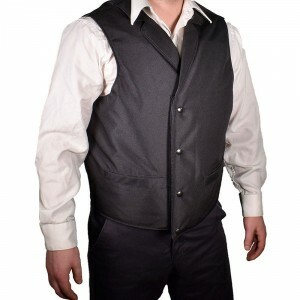 The High Roller - Level IIIA(3A) Ballistic Concealment Vest gives you protection from handgun rounds up to a .44 Magnum and lets you look good doing it. Our ballistic concealment vest is proudly made in the USA and has NIJ 0101.04 Level IIIA(3A) protection, which means it stops handgun rounds up to a .44 Magnum. Our sleek design looks like a vest you might wear to a fancy restaurant or for a night on the town, but it also has two concealment pockets for your Sub-Compact to Compact handguns. This gives you the element of suprise if a dire situation arises. Our vest overlaps in the front with a velcro closure, which gives you full wrap Level IIIA protection. Never sacrifice safety or style again, because our High Roller Ballistic Concealment Vest offers the best of offense and defense all in one package! Keep protection within reach with Bluestone Safety Products.